Having a bad day? 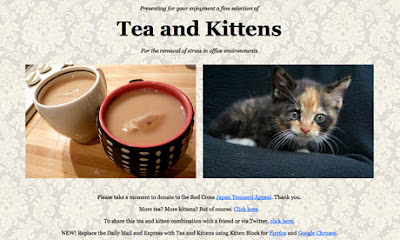 Then you need Tea and Kittens, a new single serving site designed "for the removal of stress in office environments." This delightful page offers up exactly what its title implies: Images of darling kittens, alongside comforting mugs full of tea. If your distress extends to online news, there's also a "Kitten Block" download available to replace the "angry-making" British Daily Mail and Daily Express websites with the Tea and Kittens homepage. If only they would make it work for certain U.S. sites too! Just the kind of website I've been looking for at work! Perfect! Perfect! And thank you so much for the sweet comments about Scrappycat.